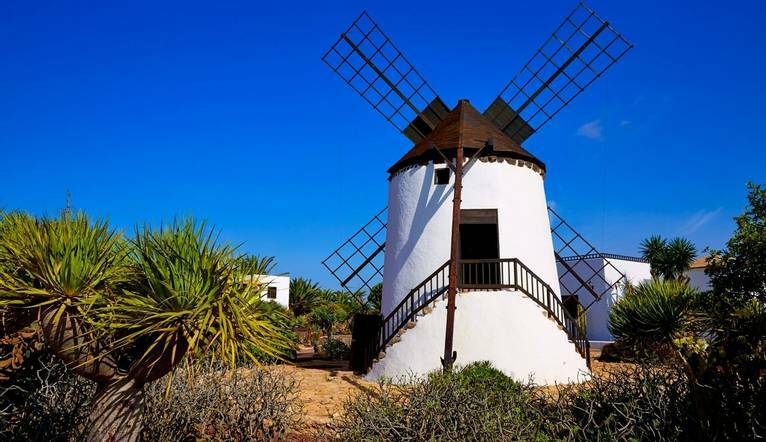 Join us as we explore Fuerteventura, the oldest of the Canary Islands with its magnificent coastal and volcanic landscapes on this 7 night walking holiday. When not exploring we can put our feet up at the 4 star Elba Sara Beach and Golf Resort with its enviable location overlooking the ocean and long sandy beach. Fuerteventura lies at the eastern end of the Canarian archipelago, only 90 kilometers from the African coast, just south of Lanzarote. With a land surface of 1,659 square kilometers, it is the second largest of the islands, with some truly unique scenery made up of dunes and deserts, a wild coastline and idyllic beaches, numerous volcanoes and canyons, remote villages and mountain goats aplenty. Beginning in the village of La Oliva we walk up into the mountains to Tabaiba's springs, with great views of the north and east of the island. After a short pitstop in the village of Vallebrón, we continue up the Muda Mountain, the most important summit of the north side of the island, from where there are magnificent views of Fuerteventura, Lobos and even Lanzarote. The walk ends with a pleasant descent to the villages of La Matilla and Tefia. Starting at Morro Veloso, we head to Betancuria ( the city founded in 1404 by Jean de Béthencourt self-proclaimed king of the Canary Islands) before continuting to the hamlet of Rio Palmas, which lies in beautiful tropical landscapes. We continue along the Barranco de Las Peñitas enjoying a pleasent descent to the coast at El Jurado beach. We start at the Jable de Jandia, an amazing vast area of sand straight from the Sahara, shaped by the wind. We walk through the Jandia Mountains on tracks, discovering stunning deserted beaches until we reach reach Cofete. White sand, black lava, red sediments and the wild coastline are the ingredients of this amazing day! The transfer time from Fuerteventura Airport to the hotel is approximately 15 minutes, depending on weather and traffic. Four guided walks are included in the programme. Your walking guide will advise you in resort of the daily programme. The walking programme is graded as Medium and you can expect to walk between 14 to 17km per day, with some ascents/descents, rough underfoot terrain and high altitudes involved.